Four years, I wrote a series of blog posts about the advent of the "Google Plus Project." We are now seeing the pre-written eulogies for G+. 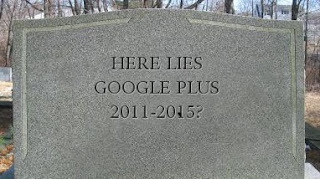 I really can't fault @stevedenning in his logic as to why Google Plus "died." But he assumes that it was built to take on Facebook where it lives, and if you look back, my contention was that it was NEVER designed to take on social. He also assumes (like everyone, you would think) that it was built to "succeed." My newest contention: it wasn't built to last. It was built to get more people on the "Google platform." I said that all it would take is "nibbles" at the other "social" tools. Is it just coincidence that Facebook is rolling out a SEPARATE messenger web app along with its regular app now? He is VERY correct that Google doesn't know marketing, but when have they EVER? Google I/O is happening today and should disclose more about where G+ is headed.